Jesus said, "It is written that man does not live by bread alone, but by every word that proceedeth out of the mouth of God," and he told us to "abide in the word and let the word abide in you." What is this "word" and what does it mean to "abide" in it? This is the key question that Joel Goldsmith answers in Living by the Word. Throughout the book, Goldsmith considers specific Scriptural passages and takes the reader far beyond their literal sense to unveil their inner spiritual meaning. He gives thorough and practical instruction about how to work with Bible passages to discern their depth and live by them. "'When we study and search the scriptures," Goldsmith says, "we are fed as never before; we are guided, directed, and protected as never before; but always in direct proportion as we make these passages of scripture our daily bread." Throughout all the Infinite Way writings, Goldsmith asserts that all discord in life is the result of man's sense of separation from God, and that coming into the realization that "I and the Father are one" is the liberating influence. 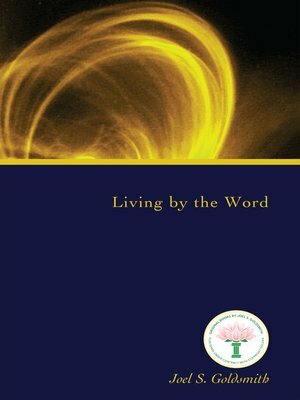 In Living by the Word, he shows the reader how Scripture can play an important role in that journey back to our true Self. As he says, "The way to oneness, to conscious union with God, is through the word of God. It is the word of God maintained in consciousness, lived with, dwelt upon, and abided in that ultimately restores that conscious union." By working with inspirational Bible passages and applying them in our daily experience, our mind begins to lose its spiritual ignorance and becomes illumined, and the outer experience of life becomes harmonious. Goldsmith explains that the spiritual promises in Scripture apply to us only when we are in our spiritual oneness with God and receive them as impartations from within. In a word of encouragement to engage in the valuable practice of Scriptural study, Goldsmith says, "The Bible and the truths of the Bible will not do anything for you in a book ... These Bible texts begin to work for you only after you have moved them out of the books into your consciousness, dwelt on them, pondered them ... and let them take root and grow." Living by the Word shows the reader how to do just that.